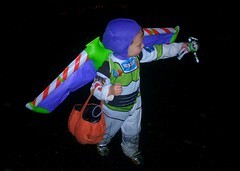 Here is William...as Buzz Lightyear...playing with Buzz Lightyear. He had a blast on Halloween with his brother and other friends. It was a pitty we had scattered showers, but I don't think any of the kids noticed. 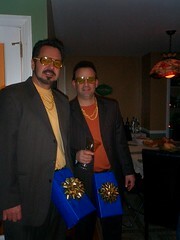 Halloween for the adults was celebrated at Doug and Anabela's house this year. The costume demonstrated an eclectic mix of creativity and...well...ah...creativity. For example, Tom and Brian chose to show up as Justin Timberlake and Andy Samberg's alter egos from an Emmy Award winning skit from SNL. William is obsessed with pumpkins. This time of year, he sees them everywhere. He doesn't miss one. Here Grandma is helping him decorate the pumpkin he got at Jackson's birthday party. More pumkin news: William brought a pumpkin to nursery school on Thursday, where the class got to paint and sparkle them as a class project. William was very excited. His teachers noted that he spent extra time on this project and was very excited about it. Dad bought this home on Friday and proudly displayed it on the front porch with the other holiday decorations. Unfortunately, it rained on Saturday...and dad was not aware that they used water based paints. This morning we went to the gym and found the pumpkin sitting in a pool of paint and glitter. William wasn't quite sure what had happened...but seemed to be OK with the situation. Tristan and William helped their friend Jackson celebrate his second birthday at Outhouse Orchards. The Halloween themed party included a hayride, pumpkins, facepainting and slimy Jell-o spiders. What could be more fun! Sadly, Tristan and William would not sit for the picture above. It needed to be patched together from two similar pictures. Thank you PaintShop! Tristan is very excited about his Halloween costume this year. Originally, we was going to be Luke Skywalker (and he wanted his daddy to be "Dark" Vader). At one point, he thought at being Batman would be cool. Things change. Tristan's mom was very excited about taking T to the Opera. She had tickets for a dress rehersal of Mozart's "The Magic Flute" and thought this would be a great way to introduce Tristan to the Metropolitan Opera...without having a 3-year old disturb the brutal Met partons. He was extremely excited and ultimately loved it. You might say "obsessed" about it. When subsequently asked what he wanted to be for Halloween, all he could say was "Papageno...the Birdcatcher!" Here is Tristan and his new hero, Papageno (portrayed here by Nathan Gunn). This Saturday was our "return to Turtle Bay". The family drove down to 46th Street in Manhattan to participate in the annual "Oktoberfest/Kid's Festival" sponsored by the Friends of Dag Hammarskjold Plaza. Along the way, we stopped by the old apartment and visited with George, our old doorman. This year, due to inclement weather, the festival was celebrated in the gym of our old YMCA...so yet another haunting ground revisited. At the festival, we ran into our friend Olga. She was very excited to see Tristan and William. The final stop on memory lane was "Good Burger". In the old days, they only had burgers, but this time the boys were able to get hotdogs, Tom had a "crabby patty". Jen did, however, haver her traditional cheddar cheese burger. All was good with the world. I am delicious as can be"